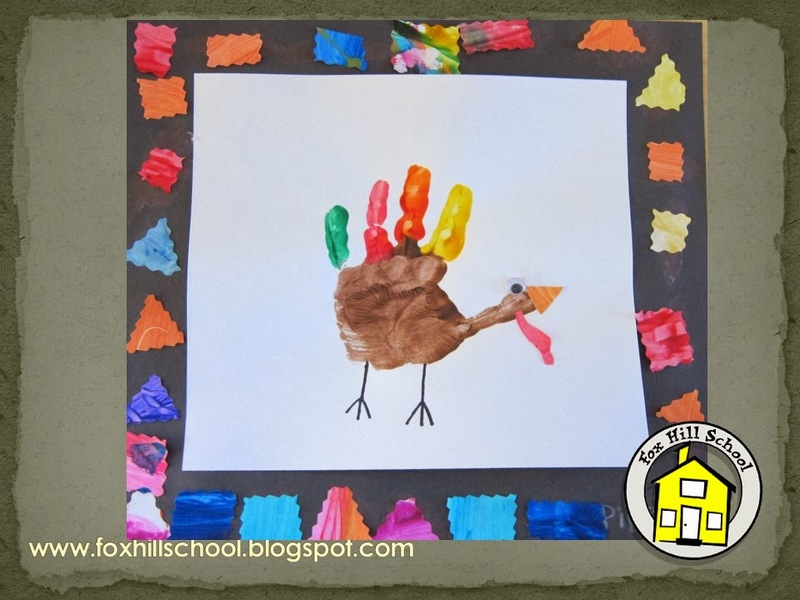 All of us at the Fox Hill School wish you a very Happy Thanksgiving! We are thankful that you share your wonderful (and adorable) children with us! Since this was our last art class before Thanksgiving I read my favorite Thanksgiving book - A Plump and Perky Turkey by Teresa Bateman. I'm generally more into the child-directed artwork, but my "mom genes" kick in sometimes. Kids can't leave PreK or Kindergarten without a hand print turkey for their moms to save and reflect on when their kids leave them to go to college! Maybe I'm projecting. Anyway.....First, I mounted a square piece of white paper (9x9) on a larger piece of black construction paper (12x12). I cut out small triangles and squares from painted paper with Krazy Cut Scissors over the weekend. You could have the kids cut their own shapes if you wanted, but in the interest of time I cut the shapes in advance. I asked the kids to glue the shapes on the black paper or "frame." Some made patterns, some were random, but they all looked awesome! 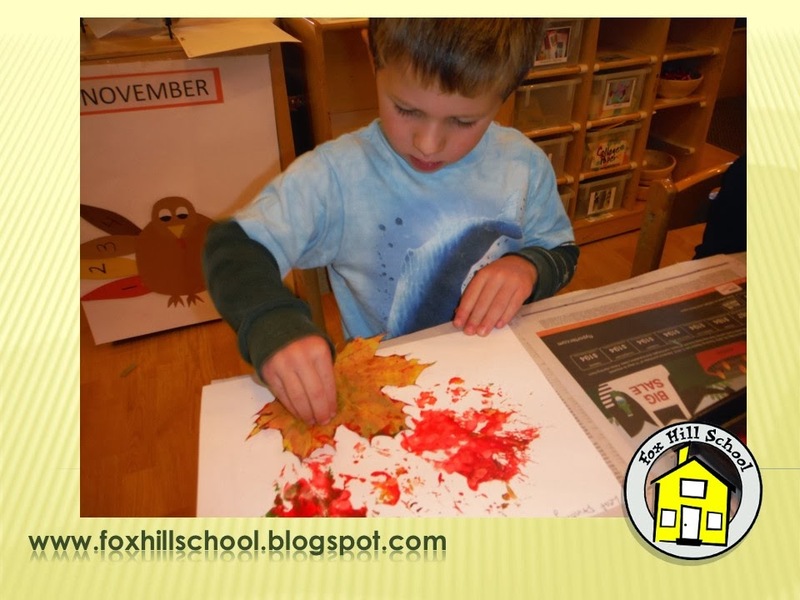 One of the moms at the Fox Hill School recently went to the Eric Carle Museum. She sent me an email to let me know that she saw a great idea in the Art Room at the museum that reminded her of our school. The Art Room at the museum has a wall of windows that, although beautiful and bright, can actually be too bright at certain times of the day. We have this issue in our upstairs classroom at the Fox Hill School. We have big beautiful skylights in the room, but in the morning the sunshine is so direct that we need to close the shades. What a waste! 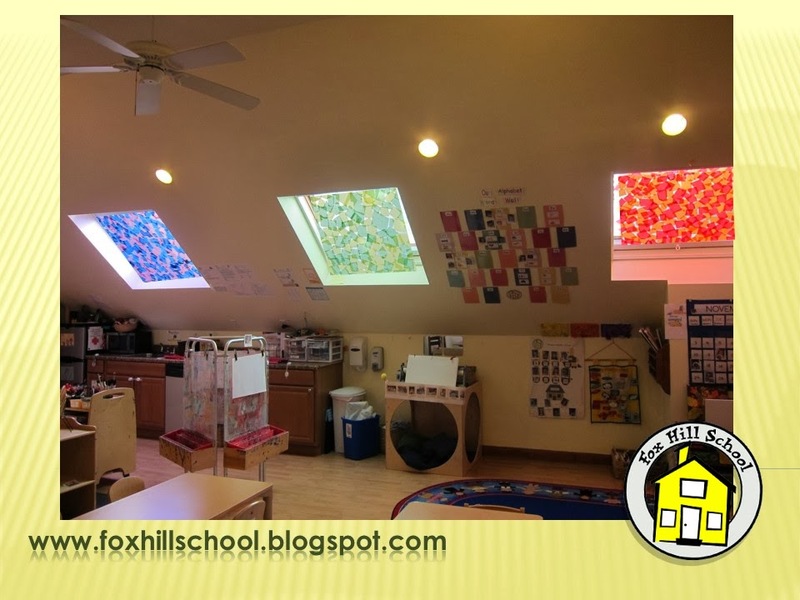 So we followed the lead of the Eric Carle Museum and had the kids work collaboratively on creating stained glass to cover the skylights. We placed contact paper face up on the table and had the kids stick tissue paper squares all over it. Then we stuck the paper directly to the skylights. It looks beautiful and we no longer have the sunlight directly in our eyes! Thanks for the suggestion, Kristin! Kids love helping in the kitchen and the grand daddy of all cooking days is Thanksgiving! Although they may not be able to help with the actual Thanksgiving preparations because of the hot oven (or other sanitary reasons), here is an easy way they can be a part of the cooking festivities! 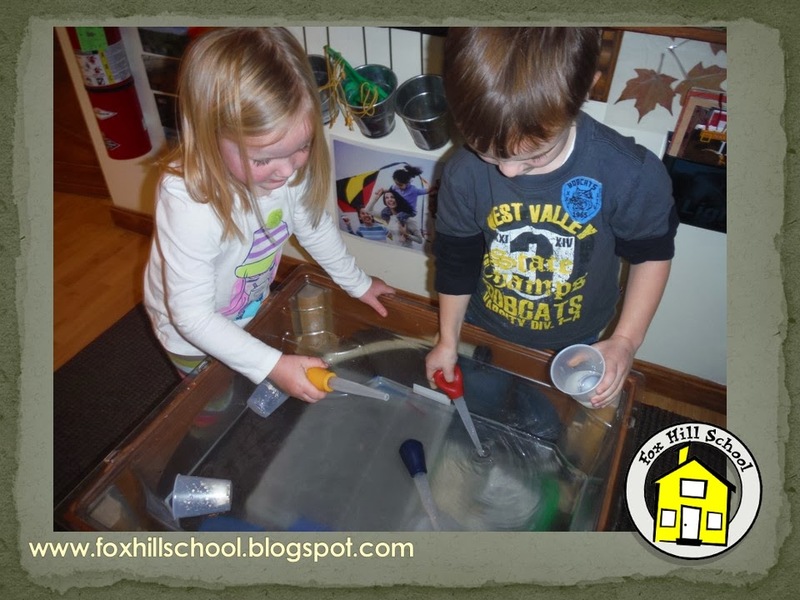 Today at the Fox Hill School we filled our sensory table with plain ol' water and added some turkey basters and cups. I wish our sensory table was octagon shaped because all the kids wanted to play at the same time but we only had four sides to the table! Figuring out how to actually get the water into the baster is a task that was not easily mastered so it took a lot of fine motor practice to accomplish the task! You can try this at your school or if you have little helpers of your own at home who want to "help" with the Thanksgiving dinner on Thursday, set them up with a big bowl of water and some basters. They could even help you wash the vegetables! The Little Old Lady Who Wasn't Afraid of Anything by Linda Williams is one of my favorite books to read to the kids in the fall, especially around Halloween. I love this book because the kids can "help" me read it! 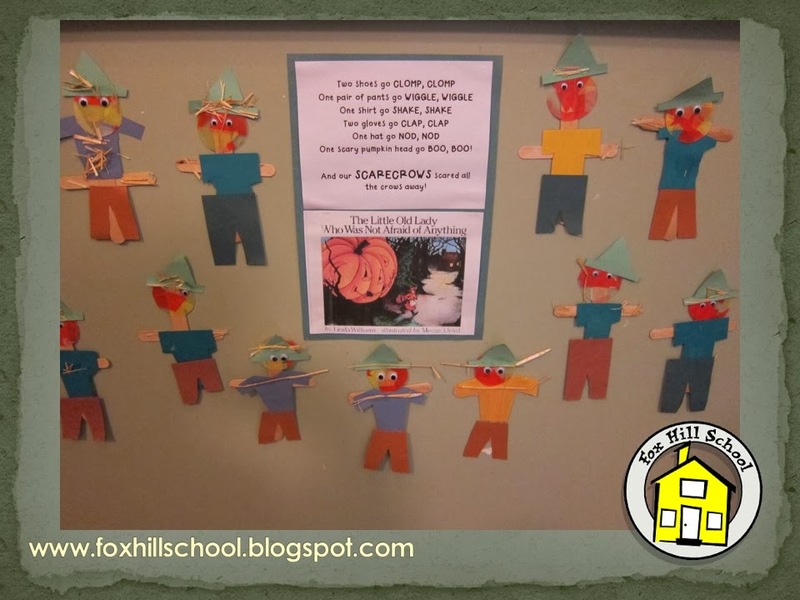 We give the kids props that correspond to the items in the story that are following the little old lady - gloves, hat, shoes, pants, shirt and a big pumpkin head*! So fun! 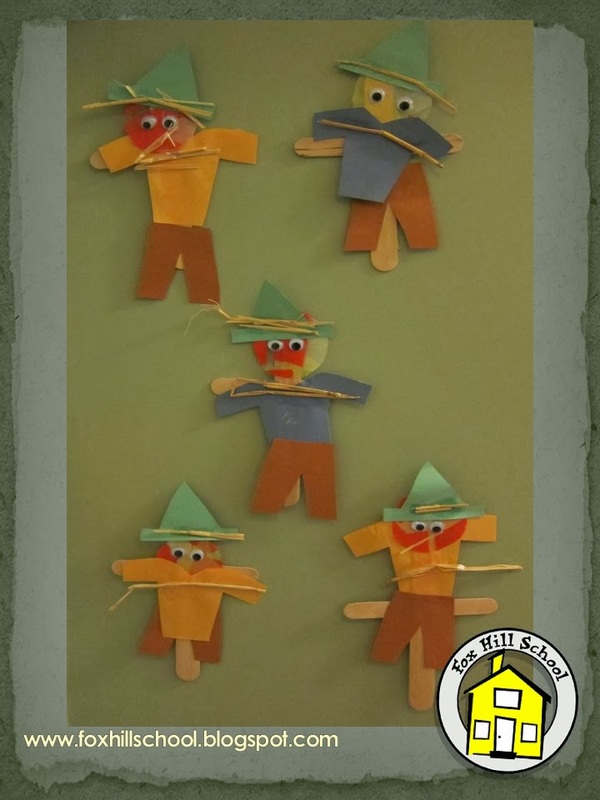 Since all the pieces become a scarecrow at the end of the story, we also made our own scarecrows. First we stuck orange and yellow tissue paper to contact paper and cut that into circles for the head. Then we glued to large craft sticks together for the body. One day we cut out pants, hats and shirts as a fine motor activity and then we glued all the pieces together, adding some straw to make them authentic. Literacy, language, fine motor and art all intertwined - what could be better?!? *Ms. Tricia made fabric pumpkins for our dramatic play area so those work great for this activity. 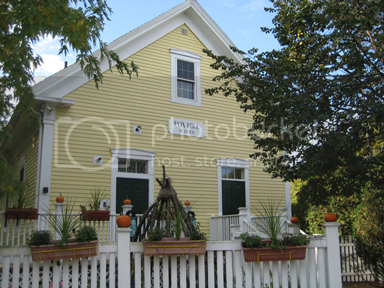 Check out our Teachers Pay Teachers site for free directions on how to make fabric pumpkins! To purchase this book from Amazon click on the picture below. 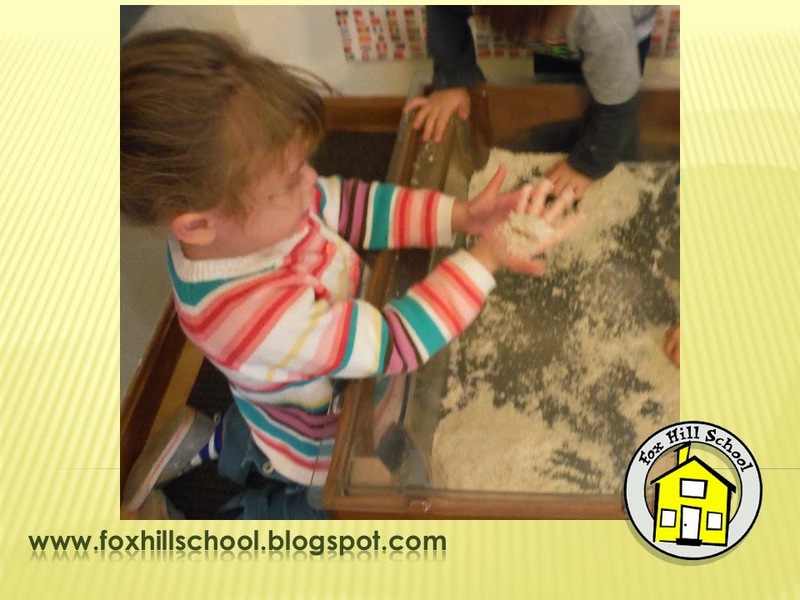 Each day when the children arrive at the Fox Hill School they are asked to wash their hands and then sign in. The parents have their own sign in sheet (for official business) but the kids are asked to sign their name each day on the kids' sign in sheet. In addition to being good practice each day for the kids, we can save the sign in sheets to use as writing samples throughout the year. We laminate sentence strips with the kids' names on them (all caps on one side, upper and lower case on the other) and leave them by the sign in sheet for them to use as a reference as they learn to write their name. Since this is the first activity that the families will encounter each day as they arrive, we also set out some items that will give them some insight into what we will be learning about that day. 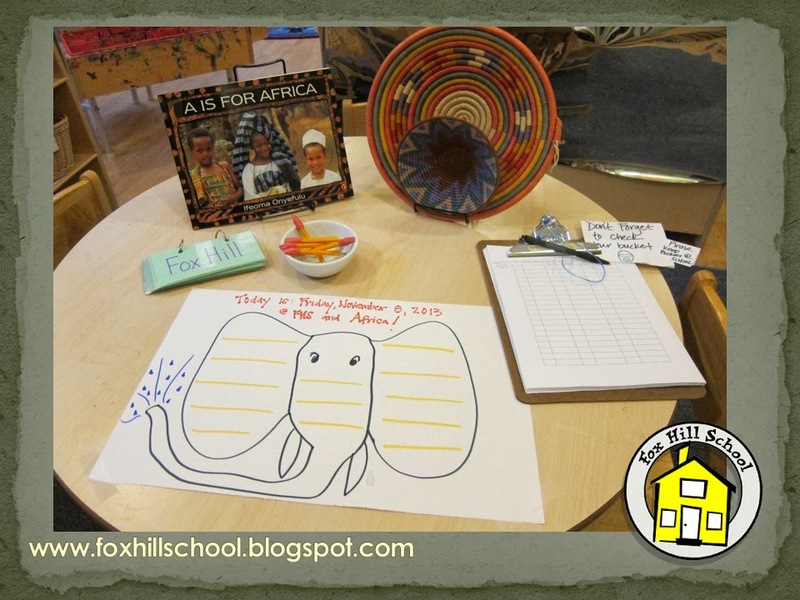 At the beginning of November we "flew" to Africa as part of our year long Around the World in 80 Tales curriculum so on this day Ms. Jen and Ms. Tricia drew an elephant for them to sign in on, set out one of the stories we would read that day and included some African baskets that a parent brought in for us to explore. 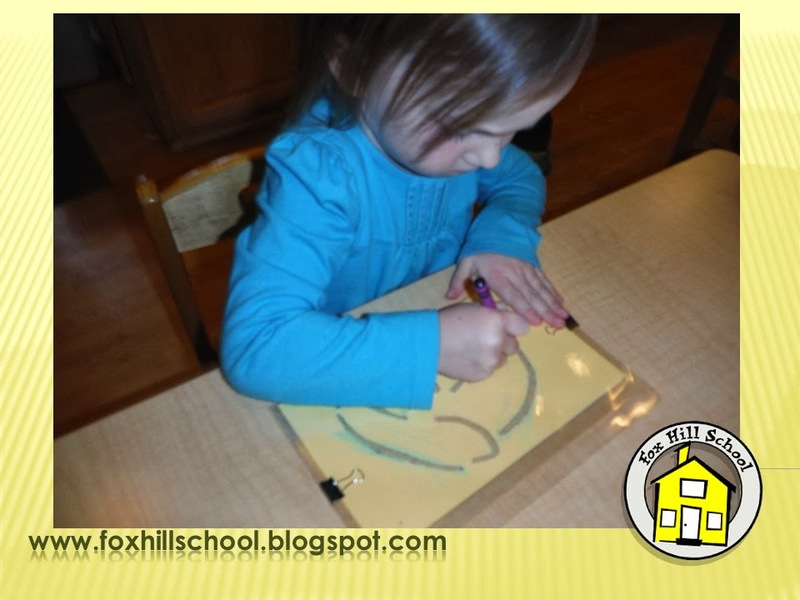 Adding things to the sign in table is a great way to communicate information to the kids and parents about what exciting things will happen at school that day! To purchase our focus book from Amazon click on the picture below! The week we read We're Going on a Leaf Hunt by Steve Metzger. We explored leaves throughout all aspects of the curriculum this week. For math we made a simple counting/one-to-one correspondence activity. We laminated papers that had a number and the corresponding number of dots on the page. 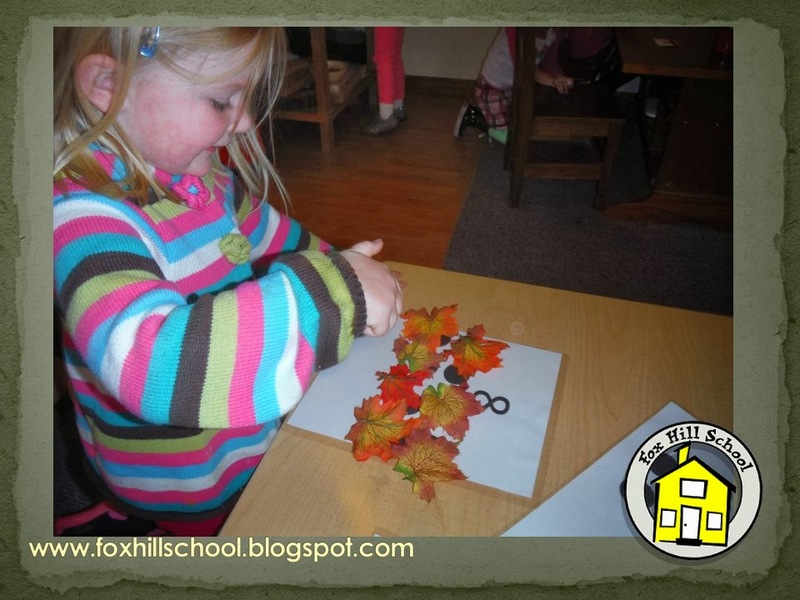 The kids were to use the numbers and the dots to determine how many leaves to place on the paper. One leaf on each dot! For science, we taught the kids three parts of a leaf (blade, vein and stem) and had leaves in the sensory table for them to explore with the magnifying glasses to see if they could find the three parts. 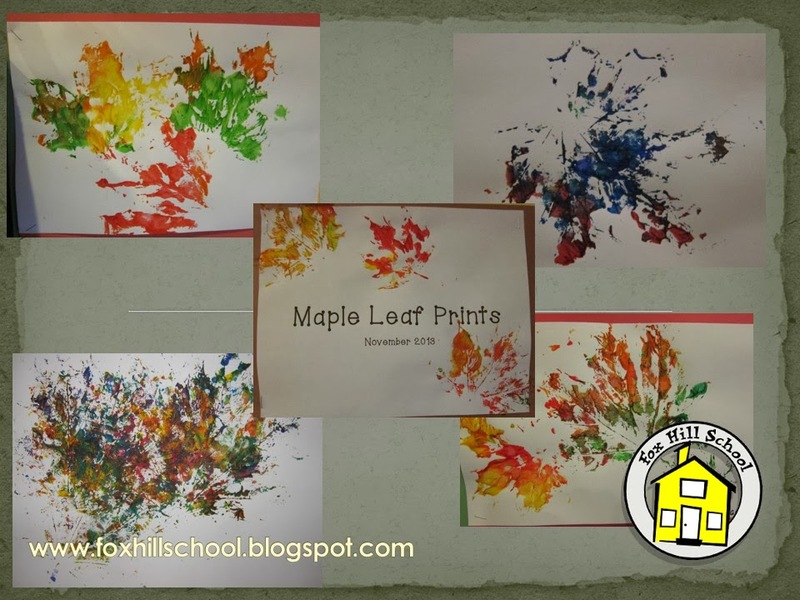 In art we created leaf prints. 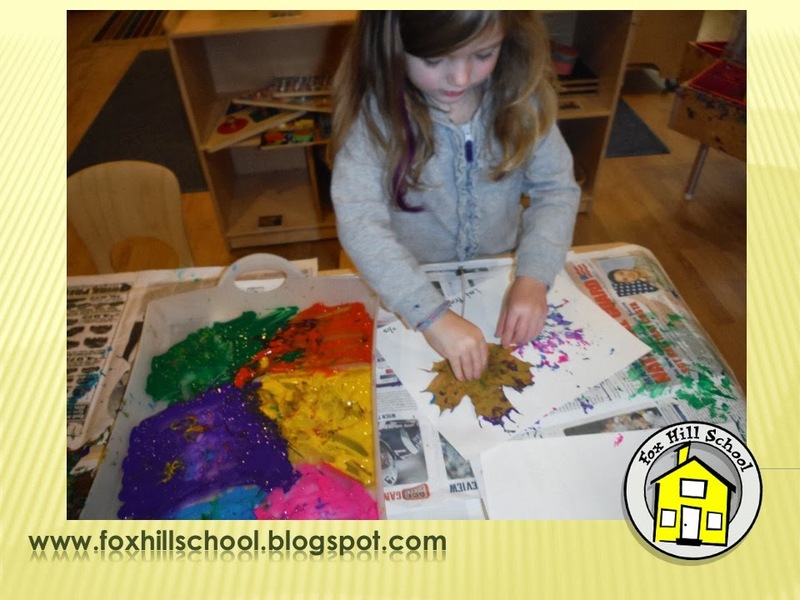 We put different colors of paint in a thin layer on a cookie sheet or plastic tray. Then the kids pressed their leaves from the playground onto the painted cookie sheet to cover them with paint. 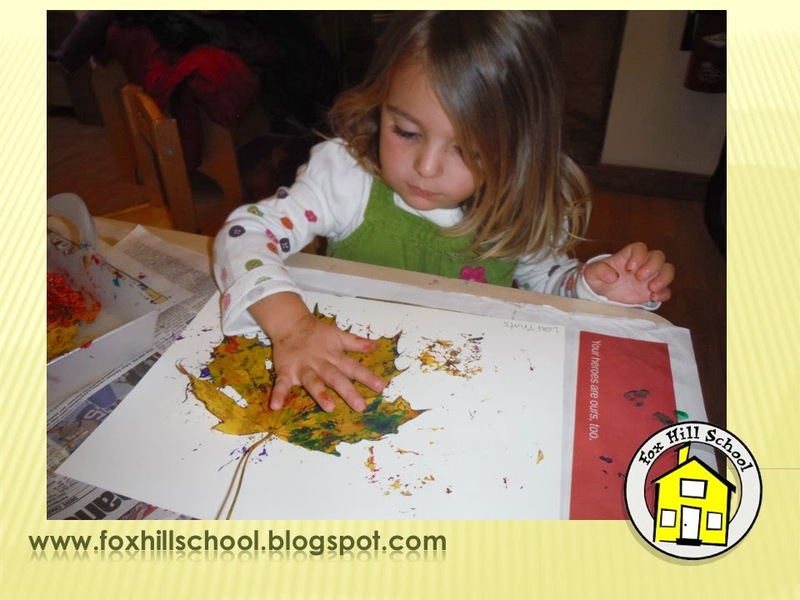 Then pressed them onto their paper to make beautiful leaf prints! If you would like to purchase this book from Amazon, click on the picture below. We are traveling to Africa for the month of November at the Fox Hill School through our focus book Around the World in 80 Tales by Saviour Pirotta. As we travel from continent to continent this year we are also learning about the animals that live in each place. 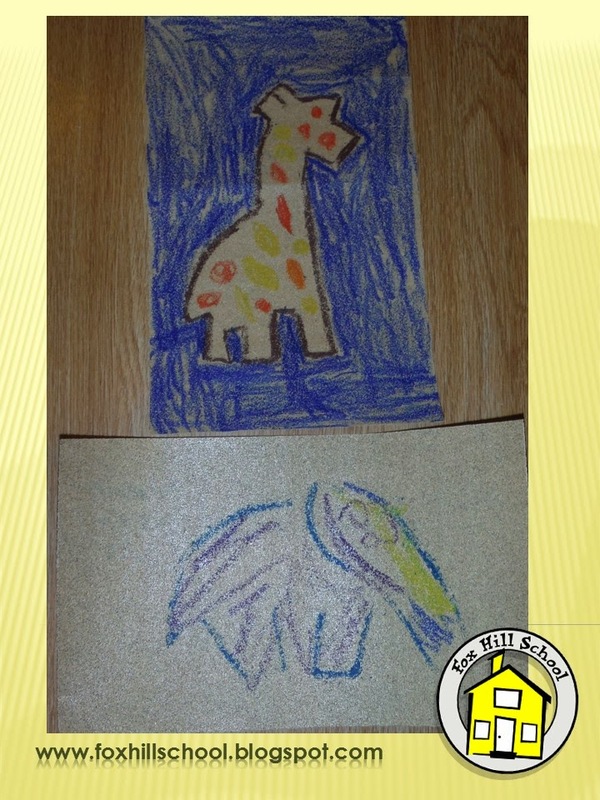 I came across a sand paper art activity online and thought we would try it. By drawing on sand paper, the result is something that resembles an African cave drawing or "Petroglyph." 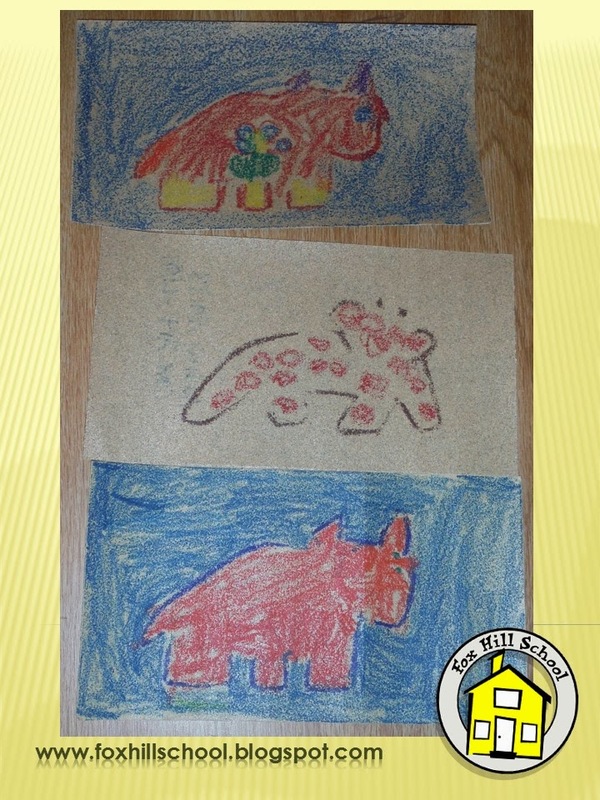 We thought the kids would have a difficult time drawing the animals themselves so Ms. Amy made stencils based on the animal cave drawings suggested online. She made a giraffe, rhino, elephant and lion. 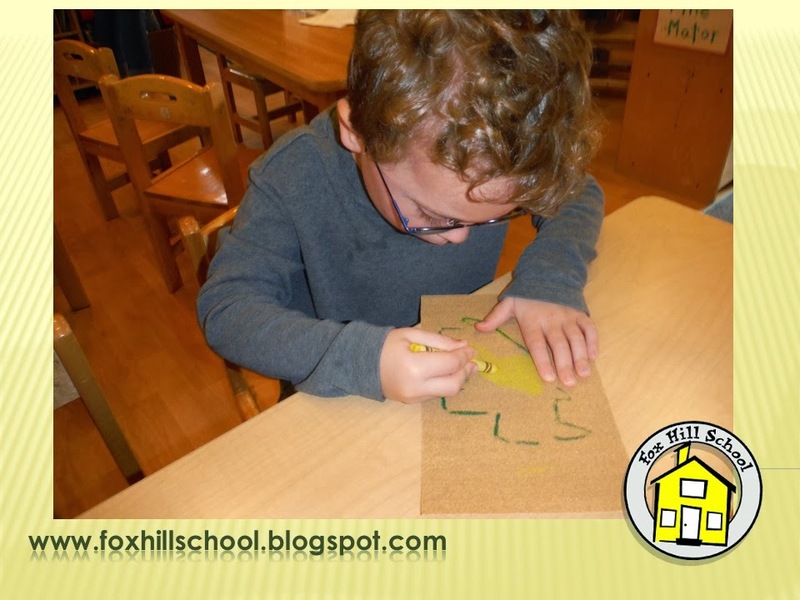 We clipped the stencils to the sand paper so they wouldn't slip as the kids used the stencils. Once they outlined their animals, we removed the stencil and they colored (or didn't color) the rest of their cave drawing as they saw fit. It was an interesting tactile art project and they really do look like cave drawings! To purchase our focus books on Amazon, click on the picture below! Easy peasy, not too expensive and the kids LOVED it! I'm not sure how many African animals were actually created but they couldn't get enough of it! 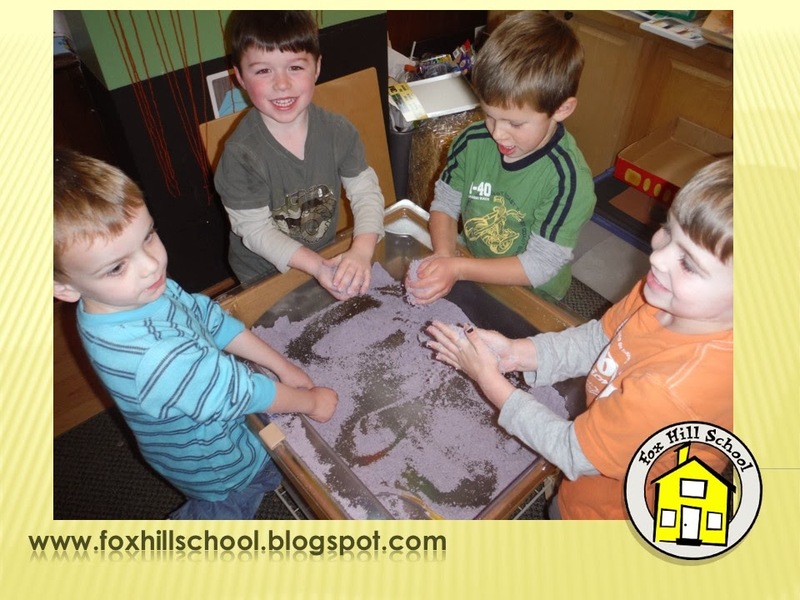 Our downstairs classroom had mushed up some purple chalk and mixed it with the sand to make colored moon sand. Our upstairs class used white play sand and it looked great too. As a bonus, it smells great and makes your hands soft! Fun, fun, fun! If you would like to purchase these books from Amazon, click on the pictures below!